Red DAG sensor multiplexed with a green cAMP sensor indicates dose-dependent signaling via a calcitonin receptor. Off the shelf kits include the cAMP sensor in BacMam, a BSL-1 viral vector for efficient delivery to most cell types. Purified BacMam, AAV, Lenti vectors by request. cADDis is a genetically-encoded fluorescent cAMP assay that detects changes in cAMP in real time. 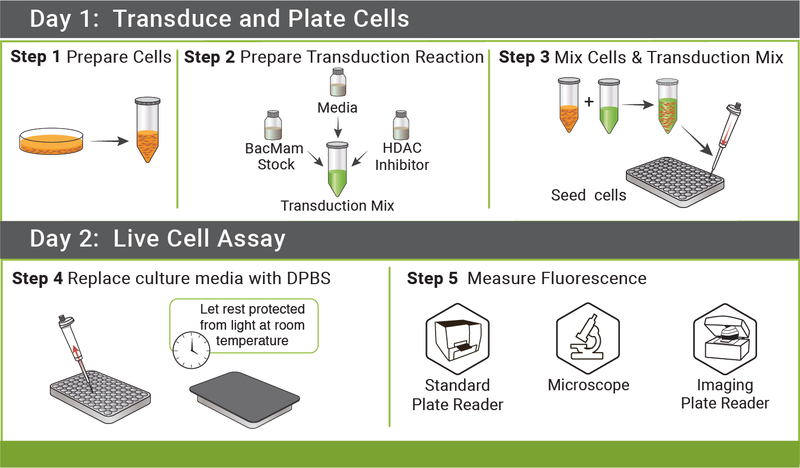 Provided online is a simple cAMP assay protocol, with no need for co-factors, cell lysis, or complex liquid handling. Check out this Live Cell Imaging video from BioTek Instruments: Kinetic Characterization of Gs- and Gi-dependent regulation of cAMP. It’s a brief animated presentation demonstrating expression & kinetic monitoring of our fluorescent cADDis cAMP Assay in live cells. X. Chen, et al. Phenylephrine, a common cold remedy active ingredient, suppresses uterine contractions through cAMP signalling. Scientific Reports Aug. 2018. T. Buranda, et al. A High-Throughput Flow Cytometry Screen Identifies Molecules that Inhibit Hantavirus Cell Entry. SLAS Discovery. April 2, 2018. N. H. Wray, et al. NMDAR-independent, cAMP-dependent antidepressant actions of ketamine. Molecular Psychiatry. April 2, 2018. H. Zou, et al. PDE8: A Novel Target in Airway Smooth Muscle. American Journal of Respiratory Cell and Molecular Biology. Vol. 58, No. 4. April 01 2018. T.B. Johnstone, et al. PDE8 is Expressed in Human Airway Smooth Muscle and Selectively Regulates cAMP Signaling by β2AR-AC6. American Journal of Respiratory Cell and Molecular Biology. Dec. 2017. K.A. McCrink, et al. β-Arrestin2 Improves Post-Myocardial Infarction Heart Failure via Sarco(endo)plasmic Reticulum Ca2+-ATPase-Dependent Positive Inotropy in Cardiomyocytes. Hypertension. Nov. 2017. J. Almaça, et al. Human beta cells produce and release serotonin to inhibit glucagon secretion from alpha cells.Cell Reports, Volume 17, Issue 12, 2016. Y.A.B. Sierra, et al. Potassium channel-based optogenetic silencing. Nature Communications Nov. 5 2018. M. Thomas, et al. Toward a High Throughput Screen for Voltage Sensors. 2018. B.S. Moore, et al. Cilia have high cAMP levels that are inhibited by Sonic Hedgehog-regulated calcium dynamics. PNAS Nov. 15, 2016.